For as convoluted as the Hyperdimension Neptunia series has become to follow over the years, the newest PlayStation 4 spin-off may very well be the most straightforward of them all. the The Gameindustri Goddesses have decided to take a step back from saving the world from piracy in the main entries and attempt to take a break by diving into an up-and-coming MMO. 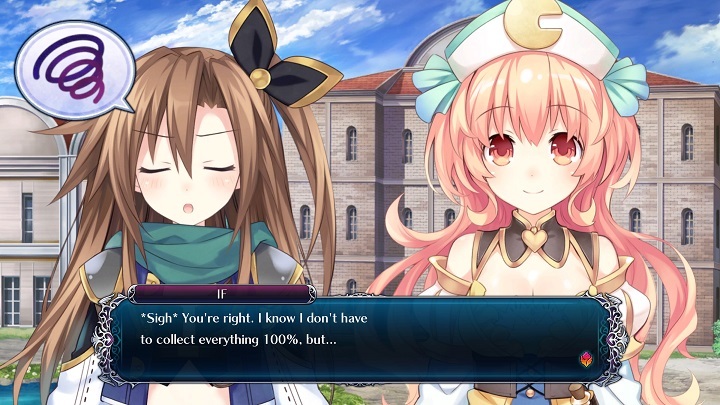 In the newest series spin-off, Cyberdimension Neptunia: 4 Goddesses Online, the iconic personified video game consoles -- in the form of cutesy anime ladies -- have been selected as MMO beta testers. Does the final gaming product end up being a success or should it go back to the drawing board? This year alone I have put an unhealthy amount of time into a certain popular MMO property. On this basis alone, along with exposure to prior Hyperdimension Neptunia titles, I was pretty sure the series' signature self-referential humor and MMO backdrop would not be lost on me, and I was more than correct. As one would expect from a Neptunia game the writing is very tongue in cheek. Neptune is constantly breaking the forth wall, Vert still proves to be a dangerously addicted MMO junkie, and plenty more established characters and quirks make their presence throughout. Though the humor rarely gets too deep into MMO jargon there are plenty enough surface level phrases and references that game and anime fans should pick up on. Couple it further with sharp localization and a cheerful script and it manages to be entertaining enough despite the totally forgettable storytelling. As for the actual story itself, it is rarely offensive as the cast seems to be in it more for fun despite the far more apparent superficial world-ending threat later on. And, unlike many prior titles, the writing personally came off as less pretentious because breaking the fourth wall feels far more appropriate in an MMO wrapping. Despite the dressing of an MMO, however, Cyberdimension Neptunia plays far more like a standard action-RPG. The actual gameplay rarely creates the strong MMO feel that various .Hack and Sword Art Online games quite faithfully evoke despite their usual single-player design (you can play missions online with friends, however), which is a bit disappointing. Also, the actual combat system isn't, uh, particularly good. Actions as well as skills control real loosely and the hit detection is at times quite unreliable (making features like the perfectly timed block counter next to useless aside from damage mitigation). Add some total damage-sponge bosses, constantly recycled enemy types, and brain-dead ally AI (regardless of the assigned "Tactics"), and the general flow of battles is very monotonous. It is a shame that Tamsoft did not even make combat look super flashy either, like they have shown with their work in various Senran Kagura titles, so it feels that much more dull despite how each of the twelve playable characters manage to play noticeably different. Still, the gameplay of Cyberdimension Neptunia manages to come across as better than the sum of its parts, although I am not sure I could tell you 100% as to exactly why. It might have to do with the central hub. Most of the features within the main town are standard fare, such as a guild in which you accept many quests, a blacksmith to strengthen gear, a tailor to get many different outfits and accessories, and even a place to practice the controls. More of the personality seems to seep into the many optional events featuring various new and old Neptunia faces within the town. As stated before, there is an oddly charming attitude to the overall writing this time around and it creates a homely feel to it all even when they are having mundane conversations like keeping in touch with MMO friends, in-world shenanigans, or even ranting to an AI nun. Speaking of which, they basically have a mini segment about how to brew many different types of tea, which is way more effective pandering to me than the occasionally tasteless random upshirt CG pictures that happen every now and then. But... maybe that is just me and not most Neptunia fans. Going back to presentation, it does sincerely feel like Cyberdimension Neptunia got the treatment of a main entry, despite its spin-off nature. The 3D character models and designs look good in-motion (questionable exaggerated 'physics'), in spite of its sloppy combat system, though it is a shame there are not more cutscenes that utilize the in-game engine. Also neat are the character design changes that totally fit the MMO theme, like tsundere Noire attempting to play as an edgy Dark Knight, or the easily-angered Blanc playing as a healer that gets displeased at reckless DPS players. Of course, those who stick to Japanese voices will find that it still remains very consistent with many familiar voice actors (...unlike the English dub over time) and most cutscenes featuring them are entirely voiced too. 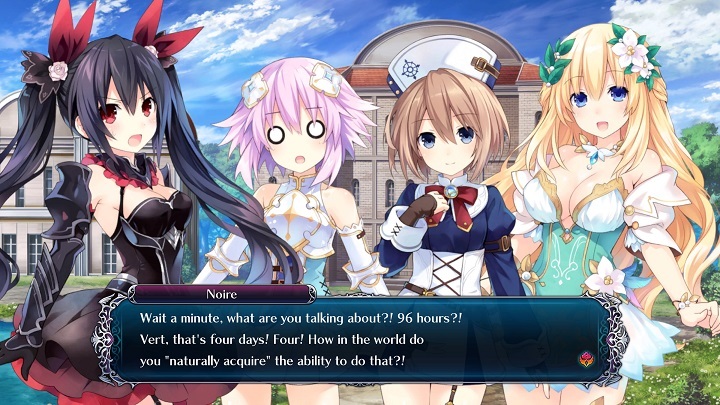 It is a weird feeling to approach Cyberdimesion Neptunia: 4 Goddesses Online as someone who had thought they have grown than tired of the Neptunia franchise over time. Because in simply changing the setting to an MMO, and by adding a much more charming writing tone, the series takes a refreshing new direction with its newest PS4 spin-off. And yet, it's too clumsy to stand on its own primarily because of its action-RPG gameplay, despite however much goodwill it attempts to develop in other departments. 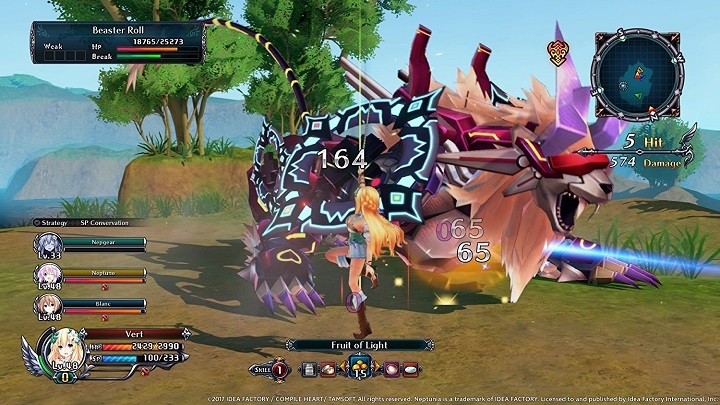 I am sure most Neptunia fans will likely embrace its energetic attitude and new setup with no hitches (while accepting the gameplay for what it is), but anyone else expecting much more than a serviceable action-RPG will be unlikely to find it no matter how far deep they dive into the newest series' spin-off. I'm actually a little surprised to see this series still going. I was so sure it had died off after the switch to Vita, or porting to Vita with the original games. I guess it's harder to kill off games that start as a joke now a days, huh? Not that I mind jokes, but like, a console war joke in 2017 seems a bit...off. Either way, shame the game play couldn't adapt like the concept. What's the saying? You don't have to reinvent the wheel, but it still has to turn. I'm actually a little surprised to see this series still going. Same, honestly. But I think it has its own passionate audience that buys each game. Or the games sell just enough for them to keep it going, apparently. The funny thing is that Neptunia is actually more popular overseas than it is in Japan. I remember it was pretty eye-opening for me when I went to a panel for it at AX this year (anything to avoid actual anime...) and way more people attended it than the Danganronpa ones, for example. Just like how there were many more people buying merchandise at the IF booth than most other Japanese publishers (like Aksys, NIS, and even Bandai. Not Atlus though... The P5 hype was real.). The Neptunia fanbase is pretty passionate as I have learned over time. Yeah, I mean, you can see they are low budget games, but you'd think burnout would've happened long ago. IS IT THE MUSOU COMPLEX APPLIED TO ACTION-RPGS? !